Are you in the third trimester of your pregnancy or do you know someone who is? The Baby Box Program is here to help. 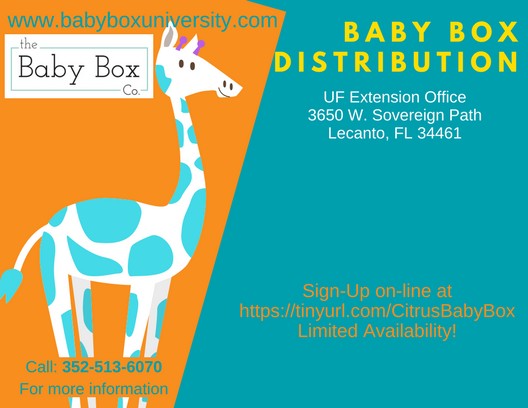 All Citrus County parents with a new addition on the way are eligible to get a box filled with infant supplies to help their babies get the best start in life. The boxes also double as a safe sleep space for baby when empty to help reduce the risk of Sudden Unexpected Infant Death (SUID), formerly known as Sudden Infant Death Syndrome (SIDS). Soon to be parents or supportive family members are invited to come learn more about the program and receive a Baby Box. A brief online course must be completed before receiving a box. Tablets will be available to complete the course during this time. Want to save time by completing the course before you come? To complete the course online ahead of time, follow the link in the Resources tab below to Baby Box University. Create a profile and complete the Citrus County syllabus. Bring your certificate with you to save time in getting your box. Please RSVP using the tab below so that we can have your box ready to go!